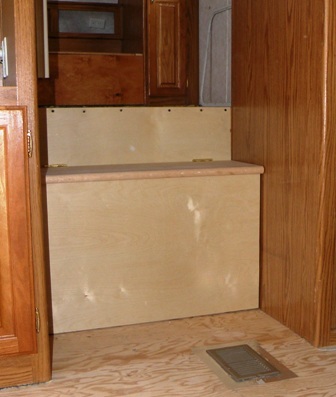 Building a Set of RV Storage Stairs became a necessary part of our RV Remodeling project. 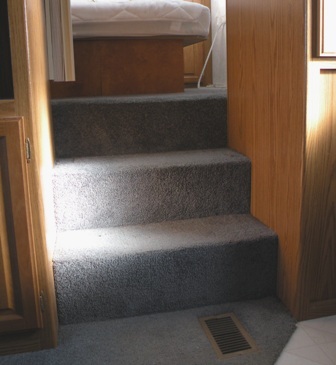 While tearing out the RV carpeting to replace it with Allure vinyl flooring I discovered how poorly built the original stairs were. The carpet itself was used as part of the structure! With it gone, the remaining stair structure left little to work with. 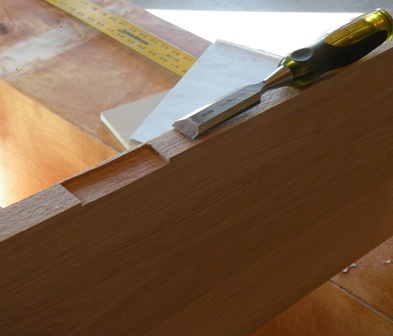 I'd planned on simply removing the treads and install hinged lids to create the storage space... but there'd be no frame or structure left to hinge anything off of. 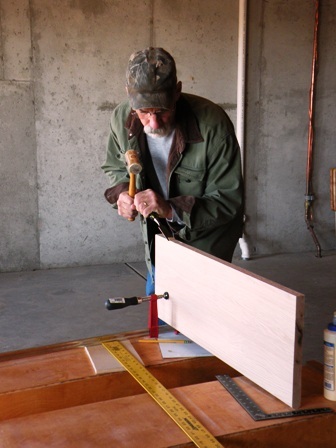 So... being used to engineering on the fly, I gathered up the materials; Baltic Birch plywood, Brass Hinges, a hasp, and 1" thick, oak treads, to build solid, attractive, RV storage stairs. 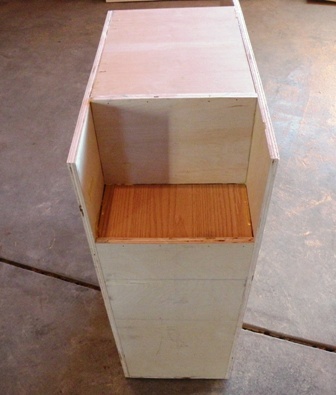 They'll be built in the form of two 'boxes'. 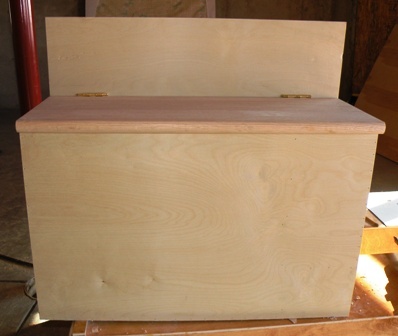 The first and largest of the boxes will be used for Dog Food Storage. One of our dogs, Buck, is afflicted with an insatiable hunger :-) ... he's taken to breaking in to any 'unprotected' food storage and eating his fill... so, constantly moving the plastic storage box to a safe location every time we leave the rig, without the dogs, has become an irritating routine... lest he tear off the plastic lid! 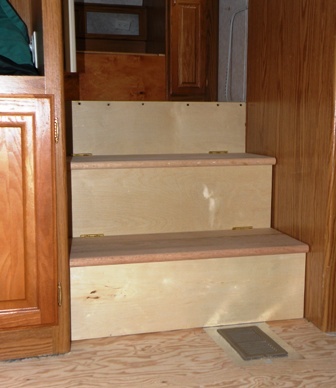 The second and smaller of the RV storage stairs is to be used for shoes... much better to my mind than putting dirty shoes in the limited closet space... or cluttering up the bedroom floor. Of course, as seen in previous pages, doing the remodeling demolition work was the first task. 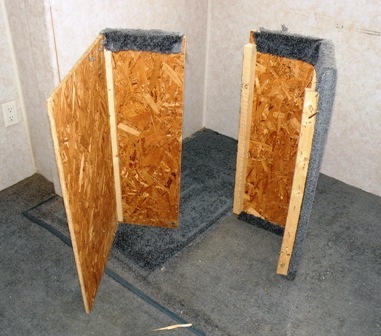 The orginal, carpeted RV stairs had to be uncovered. That danged Ol' Murphy fella really gets under my skin on occasion... I can hear that saucy lil' Irishman laughin' now! Well Ha! Your pathetic lil' pranks have to get a lot more athletic than that ya grubber! 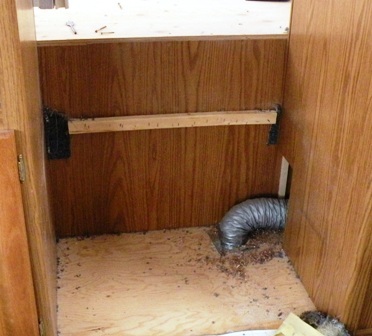 I'll just put a 'notch' in that rear box, to fit around the RV Heater Duct work. Ha! ... If they come apart... it's because somebody drove a Buick through the door! 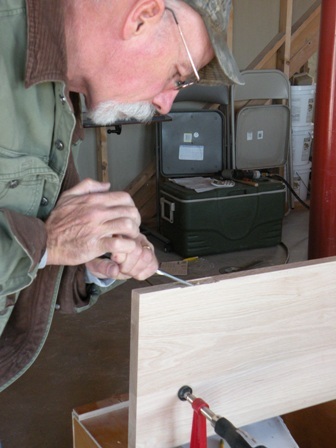 In just a few minutes you've got crisp, clean, mortises for your hinges! Set a few screws and Wa La! 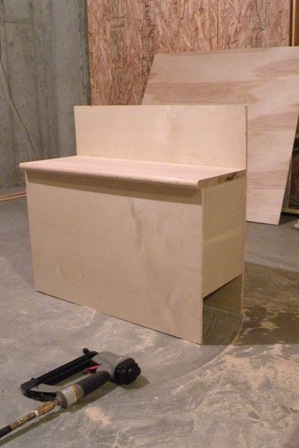 The first of the RV Storage Stairs... completed and ready to install! ... Only had to carry it out to the rig... a little wiggling... a little cussing... a little convincing, and then a repeat, Wa La! Installed! To mount the boxes I just ran a couple dry wall screw through the boxes into the plywood floor... which holds them securely... a lot more than the staples holding the original stairs! 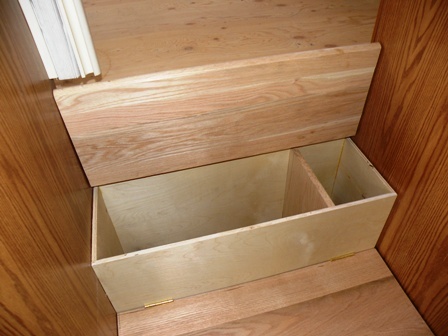 Had to wait a couple more days for the time to build and install the second of the RV Storage Stairs... But, the work got done... and now that wasted space of the original RV stairs is utilized with our brand new RV Storage Stairs.